Cast iron is the utility belt of awesomeness in your kitchen. Not only is it practically indestructible, you can cook practically anything as we’re about to show you. 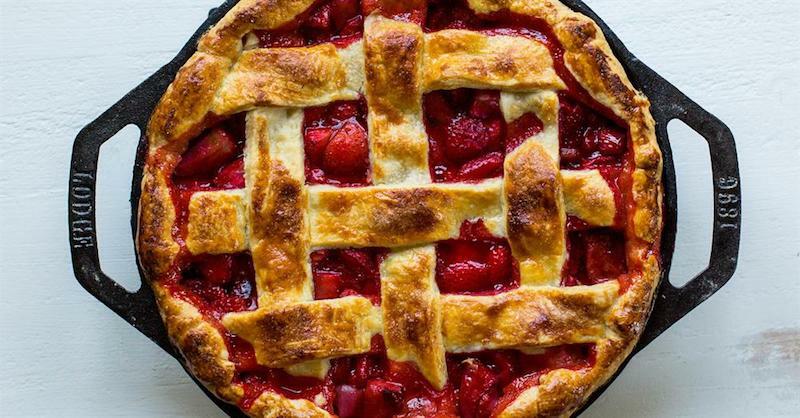 Whether you want a sweet treat, a savoury dinner or a new way to use your grill and get amazing flavours, we’ve rounded up 23 amazing cast iron recipes to get you through every meal and any craving. 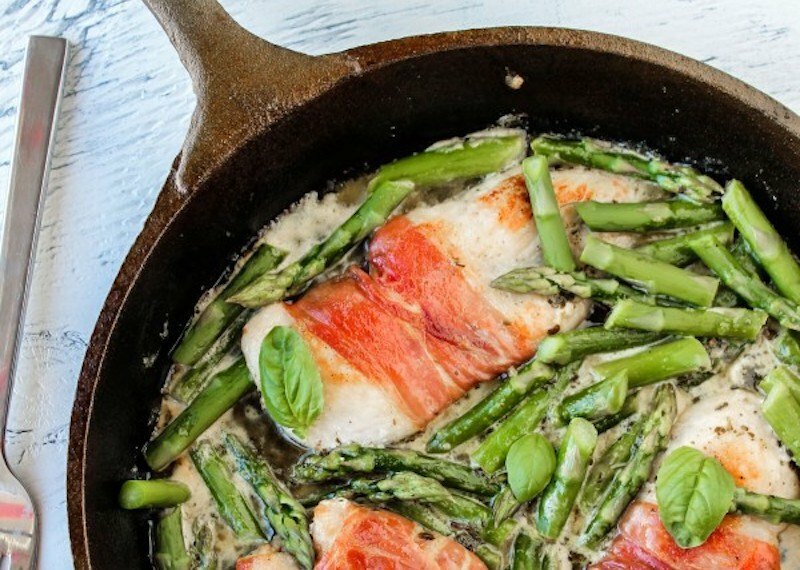 This Prosciutto-Wrapped Chicken with Asparagus from TheFoodCharlatan.com is gorgeous, pretty healthy and deceptively easy to prepare! Make this in your cast iron for a fast but still fancy-looking dinner when you’re in the mood to impress. See the complete recipe here. 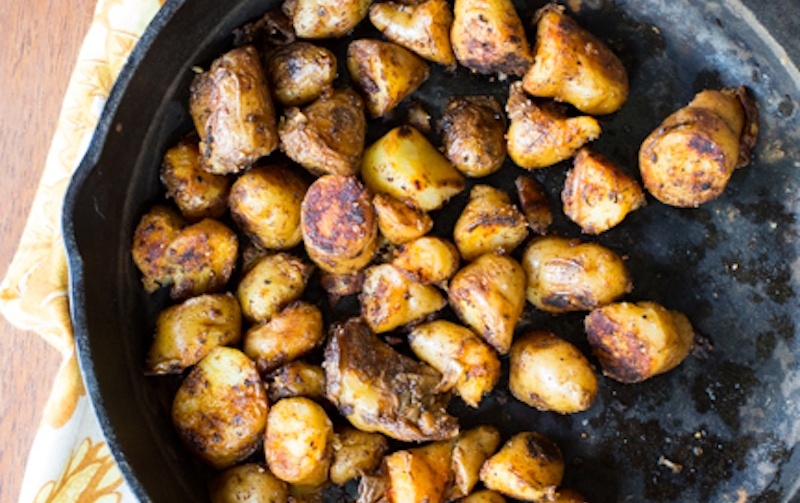 If you agree that eating potatoes at any time of the day with (or for) any meal is a good life policy, we would like to introduce this extremely versatile and simple recipe for Smokey Fingerling Potatoes from OurBestBites.com. Toss a poached egg on top for a perfect breakfast, or serve with basically any meal for a delicious side dish. We love adding them to salads as well! Get the steps to make these little gems here. Desserts in cast iron? Bring ’em on. This yummy treat from Half Baked Harvest is so glorious looking, with the added benefit of pretending it’s healthy due to all the oats (and hey, cooking in cast iron DOES increase the amount of iron going into the food, so flex those muscles!) See the complete step-by-step instructions to go with the video here. 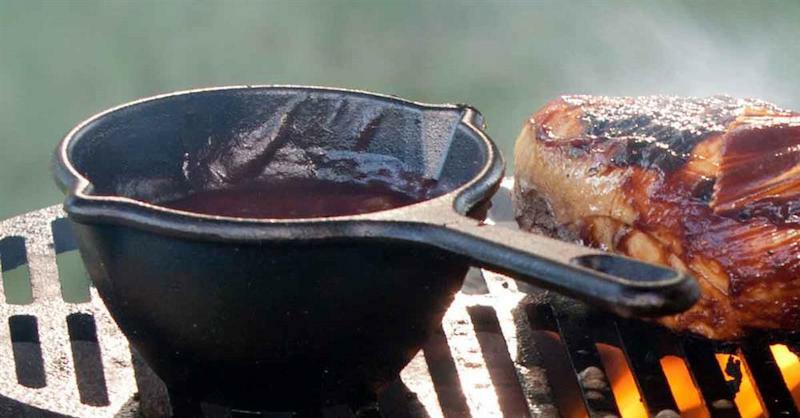 Makers of premium cast iron, Lodge has a few sauces you can try for your favourite grilled chicken this summer. From tangy tomato to a rich lemon-butter sauce, see all the options here. 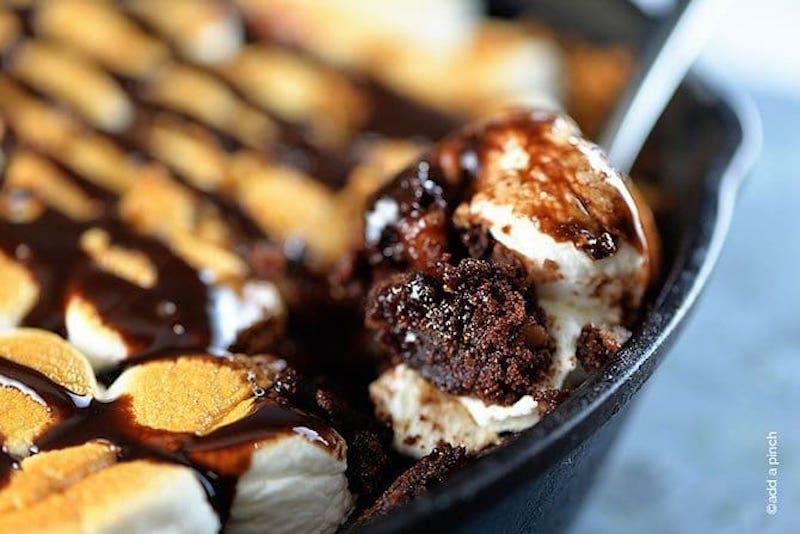 Nothing says classic summer treat like smores and combining them with brownies is just the most ingenious idea ever. Plus, you don’t even need to go camping to justify making them in this delicious recipe from addapinch.com. This simple recipe for Flat Iron Steak with Red Wine Sauce is a staple from celebrity chef Giada De Laurentiis. Take it from a pro and be sure to use your cast iron grill for that extra delicious flavour that gives you next-level cred. Plus, the recipe is for 6 portions, which makes it a great win for a dinner party. Full steps are available here. The most crowd pleasing of all dinner staples, chicken tenders go next-level on the cast iron with a sweetly spicy Sriracha sauce to go with them in this recipe from TheKitchn.com. 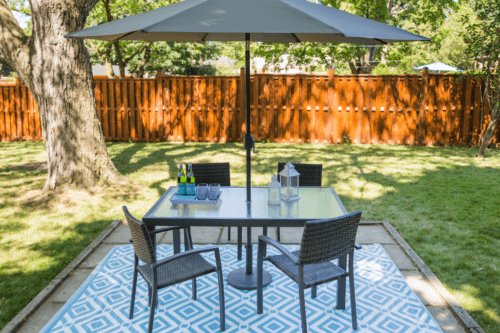 They also share some secrets about the best way to brine your chicken for a perfect marinade, so be sure to check the complete recipe out here. 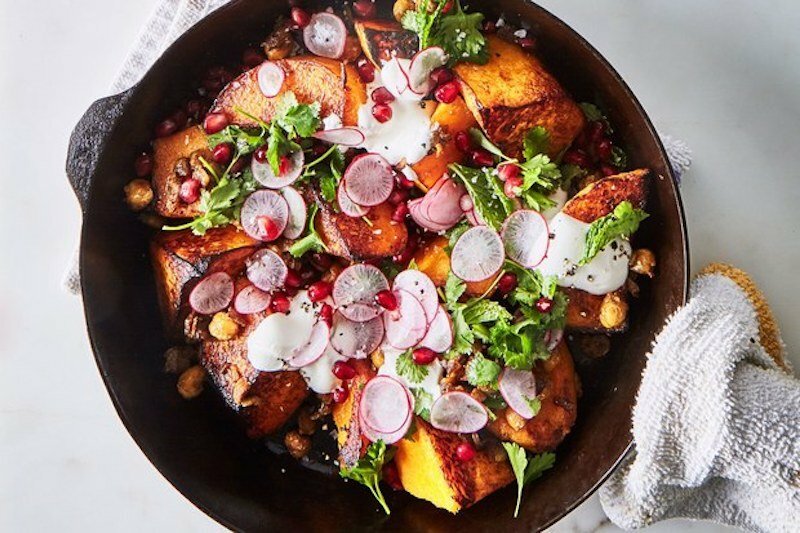 This skillet dish of butternut squash and chickpeas has a 100% “would make again” rating from Epicurious.com and we are not going to argue with that. It kicks off with an incredible hack to just leave the skin ON the butternut squash for much easier prep, which means you just know the rest of this is going to be great. Try it at home with all the instructions here. 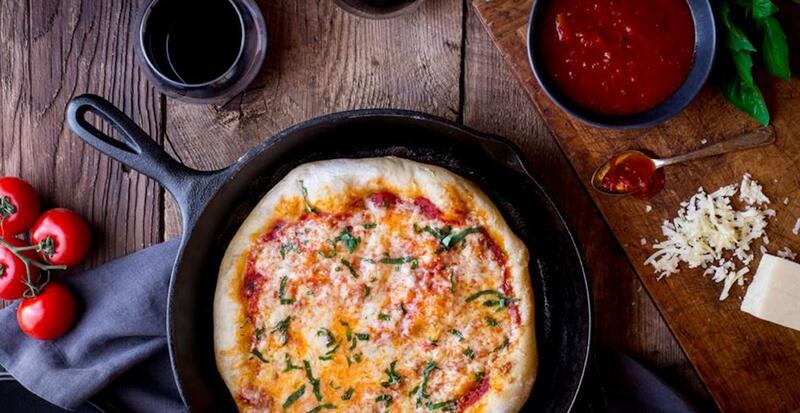 Pizza in a cast iron skillet? Yes, so much yes. Make this easy margherita pizza with fresh ingredients for the perfect Italian-Canadian fusion dinner of your dreams. Follow the steps to deliciousness here. 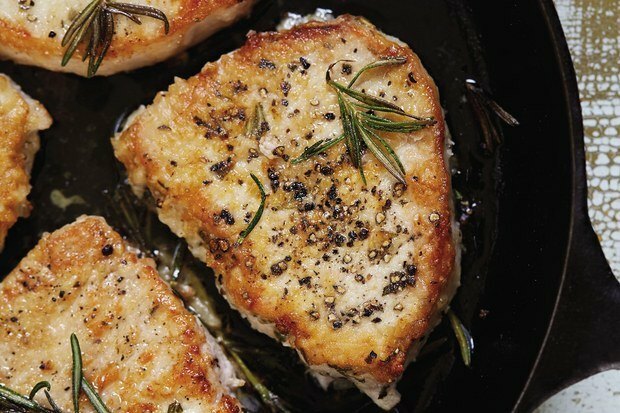 Make pork chops the whole family will love with this easy recipe that blends the absolutely lovely flavours of rosemary and properly seasoned pork. Marinate for a couple of hours and then it’s a quick trip to the cast iron for a dinner you’ll find yourself making over and over. See the full recipe here. 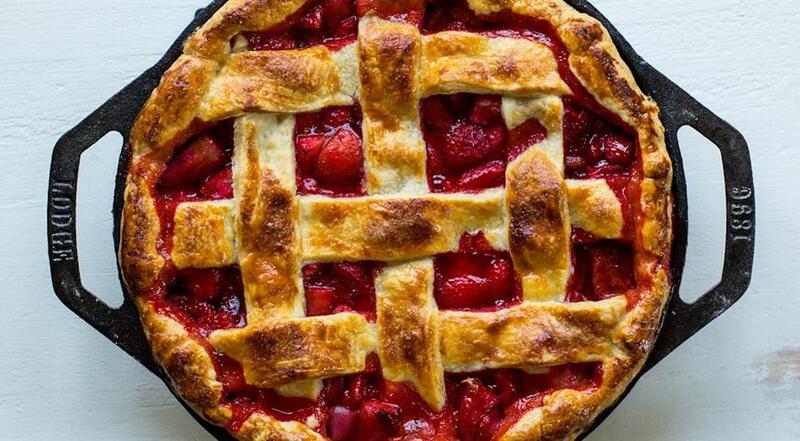 Combining seasonal strawberries with the eternal deliciousness that is pie, we present the perfect summer dessert. All the steps (including an option for making home-made pie crust) are found here. 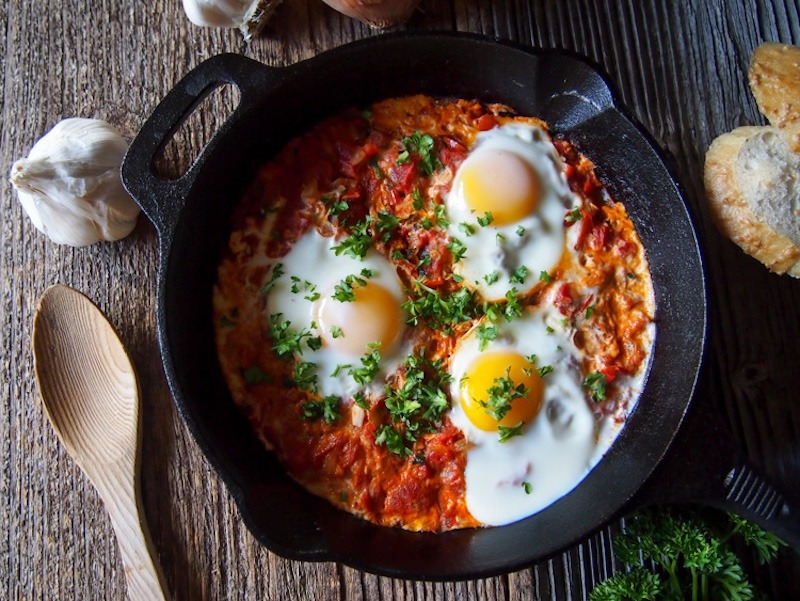 Quite possibly the most gorgeous breakfast we’ve ever seen, this healthy and surprisingly simple combo of tomatoes and eggs is a perfectly protein-packed way to start your day. We’d probably have it for dinner too, tbh. Check out the full story behind it and the complete instructions from vermilionroots.com here. All the answers to your Omega 3 dreams are in this Oven Roasted Salmon with Orange Spinach Salad recipe from TheSuburbanSoapbox.com. 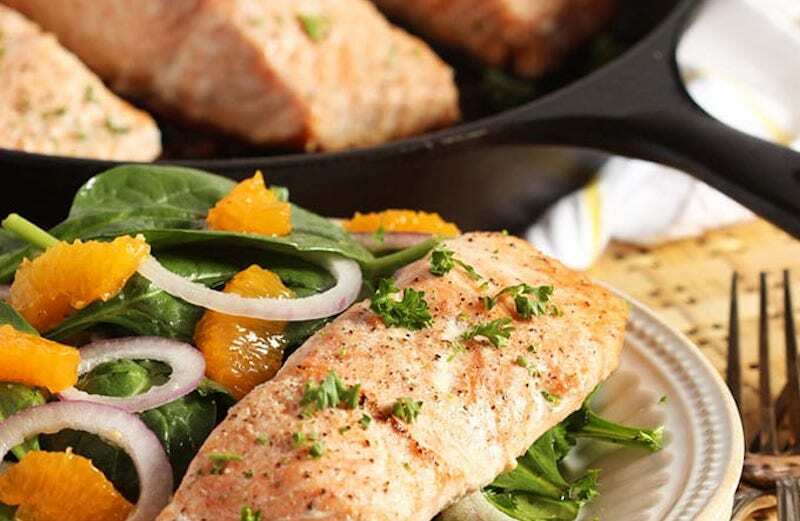 Start the salmon in the oven and finish it on the table with a lovely mix of spinach and oranges in this easy dinner that’s guaranteed to take less than 30mins to make. Full instructions are right here. Why should anyone ever have to choose between chocolate and butterscotch when the answer has been staring in our faces this entire time??? 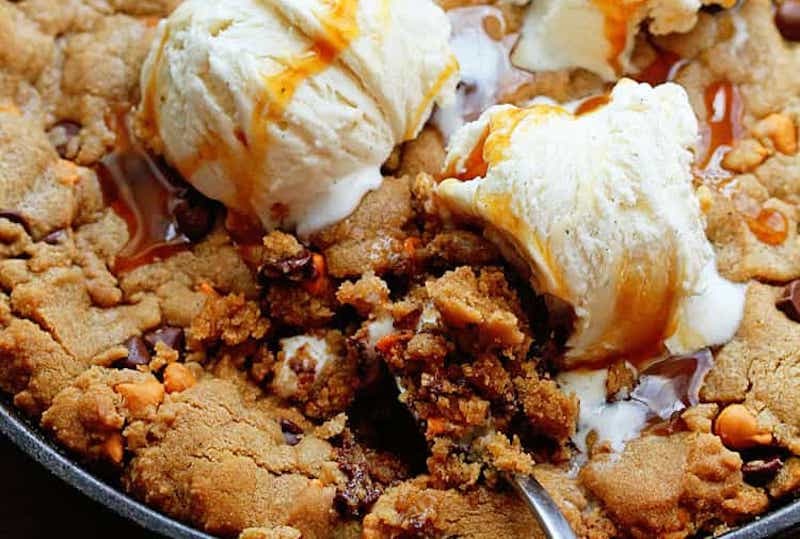 This is the most life-changing and drool-inducing recipe for a Chocolate Chip Cookie Skillet we have ever seen – mainly due to the completely genius addition of butterscotch. Make this dreamy dish yourself with the complete steps here. 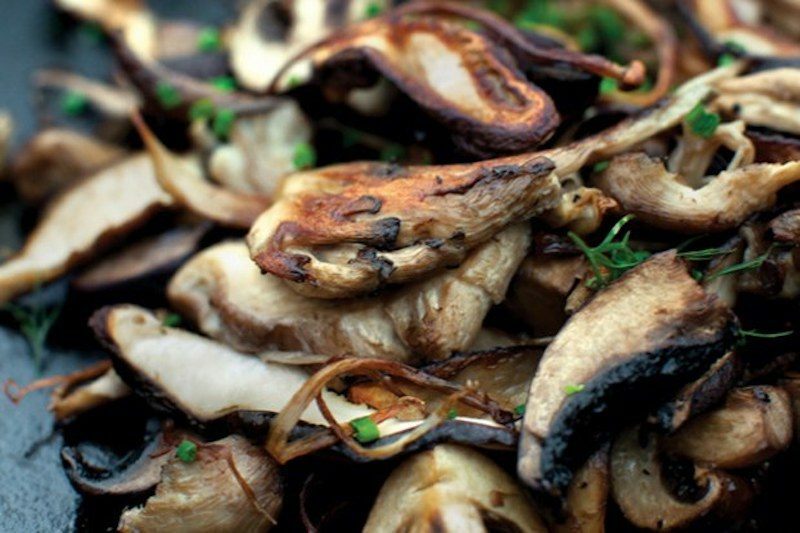 Sauteing mushrooms in loads of butter is perfectly acceptable, but you can take it to the next level thanks to this simple six-step recipe from Epicurious. Fresh herbs and the right timing are all you need for the perfect side dish for steak (or to snack on your own, really). Follow the instructions here. Paella does not get enough love. It’s so yummy, with something for everyone and when you’re tossing everything into one cast iron pan, why wouldn’t we want to make it more? 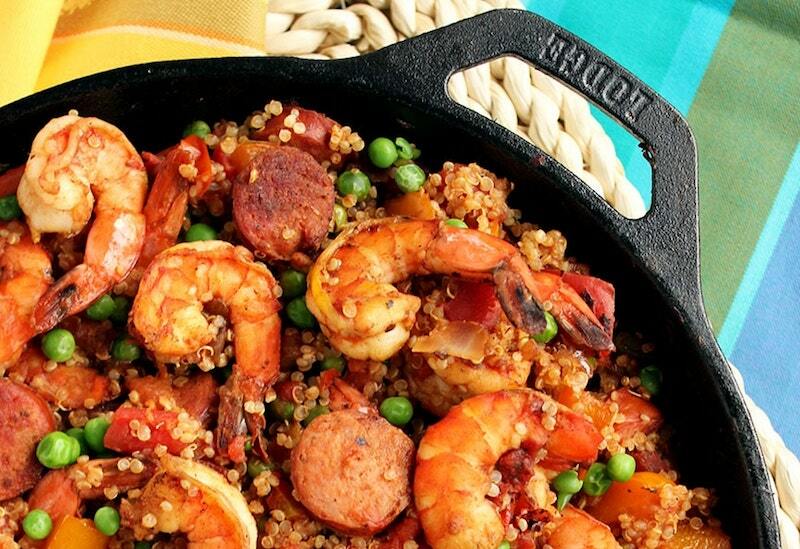 Try it yourself with this healthy, flavourful recipe featuring shrimp and chorizo from TheSuburbanSoapbox.com. 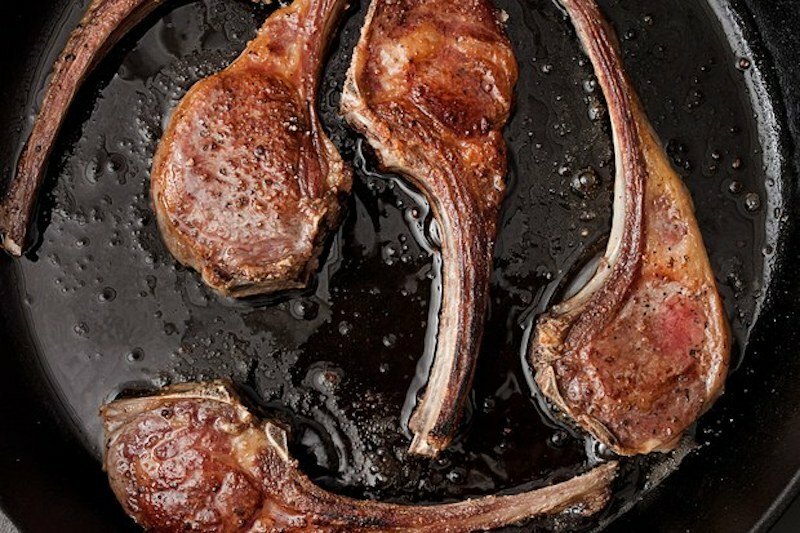 Lamb chops sound fancy and are great for a celebration type dinner, so why not make it easier to make with this simple recipe? We love this rosemary and garlic combo from Epicurious that will leave your guests so happy. Get the recipe right here. Seriously, how amazing is cast iron? We’ll be wanting to see pics, so be sure to share with us on Instagram @kspstuff! 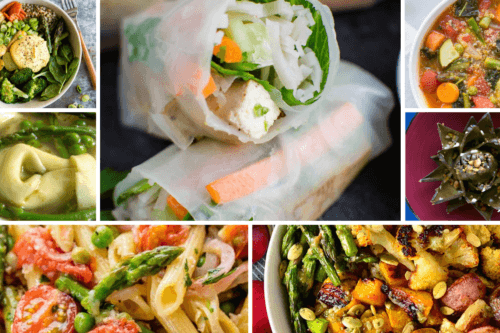 Need a place to serve all these amazing meals? 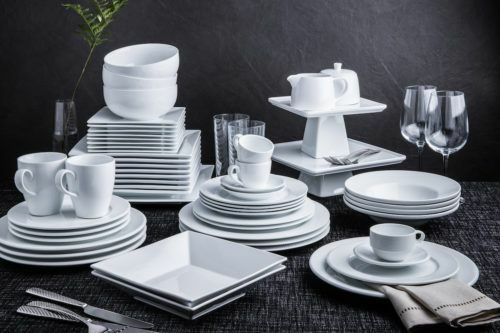 Take our Summer Party Quiz to find out what your next get together will be and then knock them out with the perfect meal and dessert, all made in your favourite cast iron.